February 18, 2016 February 24, 2016 Tim Havermans 1781 Views FIA World Endurance Championship (WEC), LMP! Today the Porsche Team concluded its second test of the year in Abu Dhabi. In total the current World Championship winning team has spent eight days driving on the 5.554 kilometre long Formula One circuit in the United Arab Emirates. The main target was tyre testing with partner Michelin. Furthermore, new components on the Porsche 919 Hybrid for the 2016 season have been tested. The programme included aerodynamic comparisons as well as testing the latest developments on the powertrain, including the hybrid system. After drivers Romain Dumas (FR), Neel Jani (CH) and Marc Lieb (DE) completed 2,059 kilometres in three days in Abu Dhabi earlier in February, the new drivers’ World Championship trio of Timo Bernhard (DE), Brendon Hartley (NZ) and Mark Webber (AU) were on duty for five days and covered 4,142 km. Fritz Enzinger, Vice President LMP1, was at the track observing the test. The team spent busy days testing the various Michelin tyres. In the 2016 WEC three different slick tyres will be used. Their names are soft cold, soft hot and soft hot plus, and cover a range in track temperatures from cool to very hot. 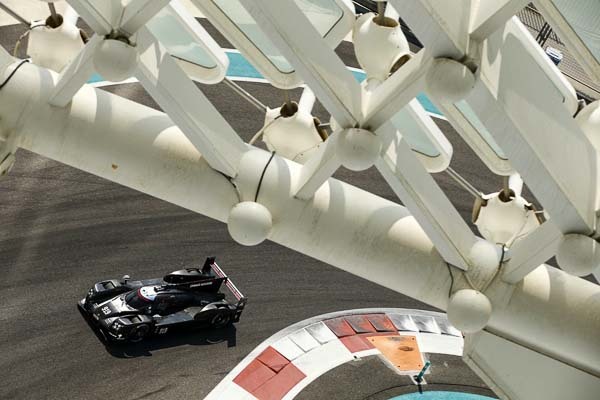 In Abu Dhabi the team had to find out which of the two constructions on offer would suit the 919 best. Furthermore, for each of the three tyres three to four different compounds were available. The team also had to choose one for the upcoming season. Tyre testing is a special discipline. Seidl: “During such comparisons changes to the car are very limited because they would falsify the results. You have to strictly separate tyre testing from the car’s development. In the end, of course, both have to be brought together and work well as a package.” The Porsche Team’s next endurance tests will be back in Europe. ← Previous The Sound of the Racetrack. The Porsche Design 911 Soundbar.